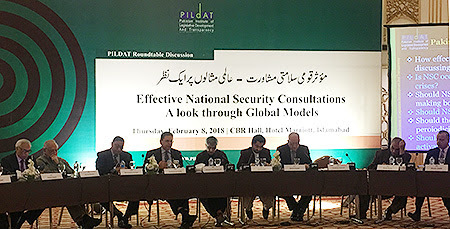 ISLAMABAD: February 08; The PILDAT Roundtable on Effective National Security Consultations – A look through Global Models concluded with the consensus demand that the NSC must meet weekly, or atleast on a monthly basis and must be made more effective. Speakers at the Roundtable included Mr. Muhammad Saddiq, former Secretary National Security Division and Mr. Saleem Safi, Senior Analyst, who were joined by members of PILDAT Dialogue Group on Civil-Military Relations including Lt. Gen. (Retd.) Mr. Humayun Bangash, Former Ambassador; Lt. Gen. (Retd.) Moinuddin Haider, Former Governor Sindh; Dr. Parvez Hassan, Senior Advocate, Supreme Court of Pakistan; Mr. Shahid Hamid, former Federal Minister for Defence; Mr. Shahid Malik, Former High Commissioner; Lt Gen (Retd) Talat Masood, Former Defence Secretary/Political Analyst; Mr. Arif Nizami, Senior Analyst and Mr. Mujib-ur-Rehman Shami, Senior Analyst. Mr. Shahid Hamid, former Federal Minister for Defence, recommended that meetings of NSC must be held weekly ahead of the meetings of the Federal Cabinet and consultations or decisions of the NSC must be endorsed by the Federal Cabinet. This is especially necessary in the light of recent ruling of the Supreme Court that it’s the Federal Cabinet and not just the elected Prime Minister, who is constitutionally responsible for executive decision-making in the country. Mr. Hamid supported the idea that a law must define the creation and functioning of the NSC.